Your body, knees and elbows absorb a lot of contact during sports like football, basketball, lacrosse, and soccer among many others. With the large amount of contact to the ground whether it be grass, turf, or hardwood and collision with other players, your body is likely to get bruised and scraped up. 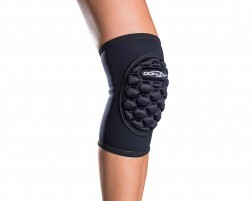 Protect your joints, body and skin with comfort and protection with knee pads, elbow pads, and padded tape. Our protective padding is comfortable, easy to wear, and easy to clean. Our Defender Skin protective tape allows you to customize and put on any part of your body that needs added padding. Play with confidence today.